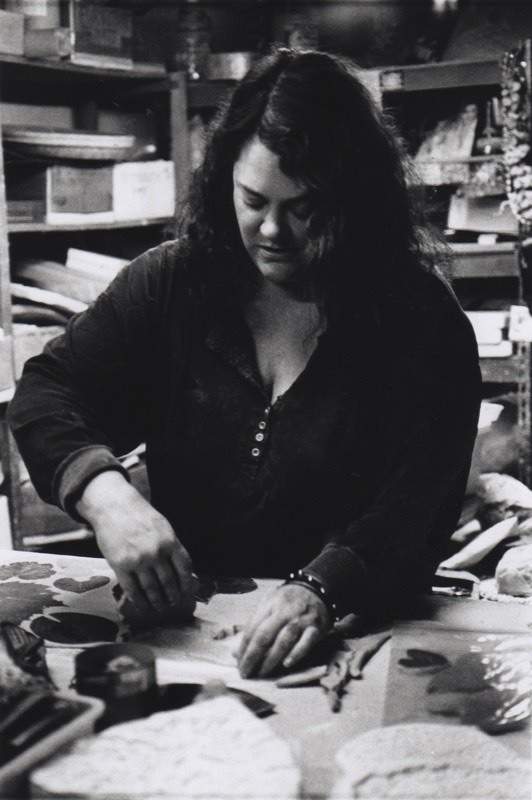 I am a clay artist, making patchwork pottery in northeast Minneapolis for 20 years now as Nameless Wildness Clayworks. house I could find; things like the stove, the woodwork, the heat vents, the doorknobs, the chicken wire in the garden, the sewer cap in the basement. Since then, I have used mold making as a means of collecting parts of significant buildings and cars, as well as random objects that appeal to me. The objects that provide the texture in my work include (besides house & car parts) plants, fabrics, drinking glasses, kitchen tools, candles, machinery, toys, and hand-carved rollers & stamps. Lately I’ve been using a lot of textures from the bottoms of shoes, and I’ve also been incorporating written words into some pieces, usually excerpts from my own short prose. I live in Northeast Minneapolis with my husband Jon and daughter Senya in a house we’ve had since 1990. When Senya was born I left my University of Minnesota office job to become a clay artist, in pursuit of happiness and a schedule that I could adapt to hers. My studio is in our basement and currently I work there three days a week. I studied Ceramics at the University of Minnesota part-time for four years starting while I was employed there. My previous education consists of a BA in Creative Writing and English Literature from Bethel College, where nine years before becoming a clay artist, I took one very influential pottery class. My clay body is a midrange white stoneware, which I fire to Cone 6. I use a combination of homemade and commercial glazes and underglazes. All of my work is food safe and microwaveable and may be washed in the dishwasher, although some pieces might not be appropriate for serving liquids. I owe many thanks to Jon and my mom, without whose support this body of work could not exist, and to the people who help me in the studio, Cortney Carlson, Scott Flewelling, Elisabeth Groh, Susanne Frentress and Jennifer Saliture. They have rolled many slabs and hand painted many pots for me, and I have learned a great deal by collaborating with them.